More than 10 million people ride the 22 subway lines in Beijing every day, making the intermingled metro system an indispensable part of the city's urban life. But things were very different just 10 years ago, when Beijing only had a handful of subway lines. In the 1980s, the city's first two subway lines dominated underground transportation until the turn of the century, when more lines were finally added. In recent years especially, the subway network has expanded considerably in megacities. At the same time, many other cities have hopped on the metro map in China. The lengthening city subway networks connect suburban districts with central areas, reduce commuter time and make people's life more convenient. This is the epitome of urban development in the past 40 years since reform and opening up began. Line 1, running east and west, began operating in 1971, making Beijing the first city in China to have an underground railway system. In September 1981, after a decade of trial operations, the line was finally opened to full public use. Line 2, a loop circling roughly under the Second Ring Road, became the second operational line, but still, the area covered by both lines was mostly in downtown Beijing. The ridership was low at first, totaling 105 million in 1985—the equivalent of 10 days of ridership today. "In the 1990s, only a small fraction of people would choose the subway since it was more expensive than a ride by bus. Plus, the number of subway stations was quite limited," said Chang Zhifu, a volunteer with the metro system for many years. "Many who took the subway had to transfer to buses to get to their final destinations anyway, so it was not a good deal," the 76-year-old Beijing resident added. After quite a few price adjustments, the fare was finally set at 3 yuan ($0.47), regardless of transfers or distance, in 2000. The next line, Line 13, a half loop that links the northern suburbs with Line 2, was put into operation in January 2003. Another line, Batong Line, an extension of Line 1, was opened in December 2003. These two lines helped the ridership hit 607 million in 2004. Line 5, which took more than seven years to construct, was opened in October 2007 as the city's first north-south line. Subway fares again were changed to a flat fare of 2 yuan ($0.32), including unlimited transfers. That year, ridership rose to a total of 655 million. In July 2008, Line 10, the Olympic Special Line and the Airport Line were all opened on a trial basis ahead of the Beijing 2008 Summer Olympic Games. With the addition of the three new lines, total ridership rose by 75 percent over the previous year to 1.2 billion in 2008. Chang served as a volunteer at the Olympic Park subway station. "Many people came to me asking how to get to their destinations via the metro," Chang said. "With more lines in the city, it was the primary choice for Olympic-goers." In November 2008, the Central Government launched an extensive economic stimulus package, helping the Beijing Municipal Commission of Urban Planning to expedite subway construction. Above-ground light rails to suburban districts, which were cheaper to build, sprouted up. It was during this period that the city's railway network began to rapidly sprawl as more than 10 new lines have been added in the past 10 years. With many more people opting for an underground commute, peak-hour congestion has become a major problem, as is the case in many other megacities around the world. "We have to wait in super long lines to squeeze onto the trains and it is normal to wait for six trains before you are finally able to board one," said Fu Yimin, from Tiantongyuan, a residential compound at the northern terminal of Line 5. "In order to be on time to work, I have to leave my house half an hour earlier to avoid rush hour." This is commonplace for most subway lines at peak hours. In order to relieve the pressure, more lines and trains have been launched. For example, in December 2012, Line 6, paralleling Line 1's east-west trajectory, was put into operation. Line 4, funded through a joint venture with the Hong Kong MTR, was built as another north-south line, reaching the farthest southern suburbs. Ridership skyrocketed to 1.2 million daily, almost twice the number initially expected. At the end of 2017, the city's subway lines measured 608 km, which is expected to increase to 630 km by the end of this year. "The subway stations now are a lot cleaner and more orderly," said Chang, who now serves at the Nanluoguxiang Station of Line 8 for two hours a day. She said she is awed by the incredible expansion of the subway system in the past years. "It is very convenient now to take the subway to go many places in the city, even Fragrant Hill in a far western suburb is within metro reach." Chang told Beijing Review, "There used to be a ticket-selling window here, but now all the tickets must be purchased through the machine." 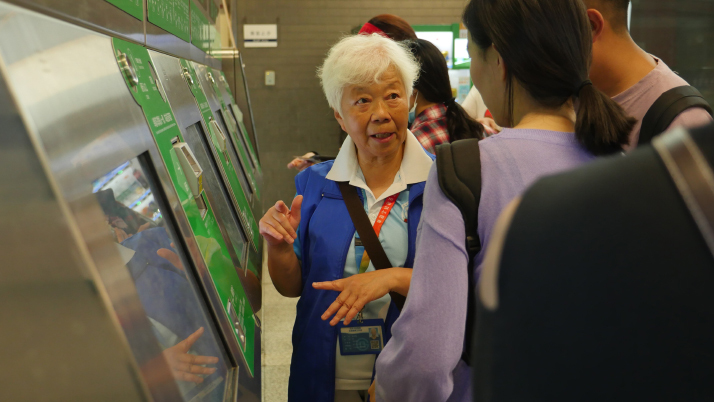 Every day, she helps passengers buy tickets using the automated ticket-selling machines. "More young people now choose to scan a QR code with their smartphones to hop on the subway, but most tourists and seniors still use cash," Chang said. "I'm happy to help people here and offer information. I think I will be a subway volunteer until I get too old to work." 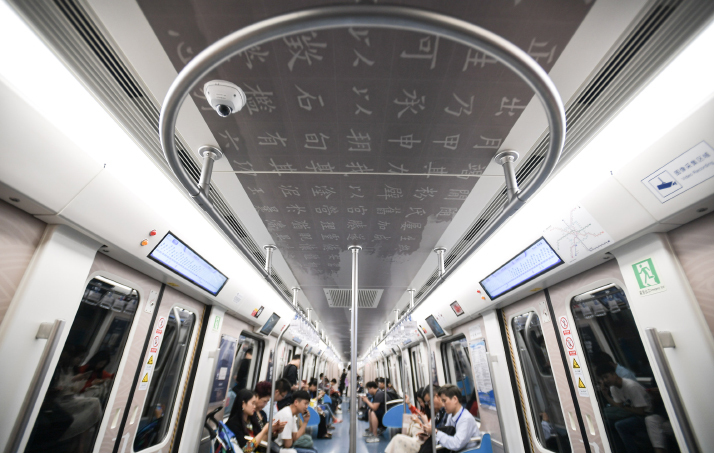 According to the official website of the State-Owned Assets Supervision and Administration Commission of the State Council, Line 12 of the Beijing subway system will be unstaffed, the first in the world. 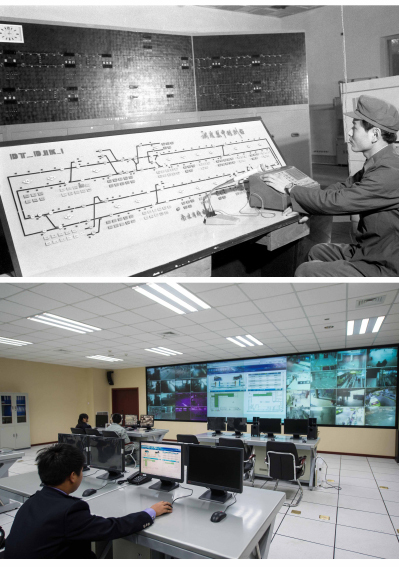 Expected to be in operation in 2021, the line will apply the Communication-Based Train Control System, which was developed domestically by the China Railway Signal and Communication Corp. (CRSC) to conduct fully automated operations. The power, fire alarm and electromechanical devices will also be automatically monitored. Zhang Zhihui, chief engineer of the CRSC, said driverless technology will help to reduce human resources and will have a major focus on device reliability and stability. Xinhua News Agency cited engineers and automation experts who said the automated operation system will avoid accidents caused by human misjudgments or operational errors. On December 30, 2017, three new subway lines were put into operation in Beijing, bringing the total line number to 22. The latest subways have been equipped with newly adopted techniques. Line S1, connecting Beijing's western districts of Mentougou and Shijingshan, is the city's first medium-low speed maglev line. Maglev trains have no wheels but rely on electromagnetic forces. Cars are elevated about 1 cm above the tracks, considerably reducing friction and providing a smooth ride. There are seven stations along this 10.2-km line with a top speed of 100 km per hour. 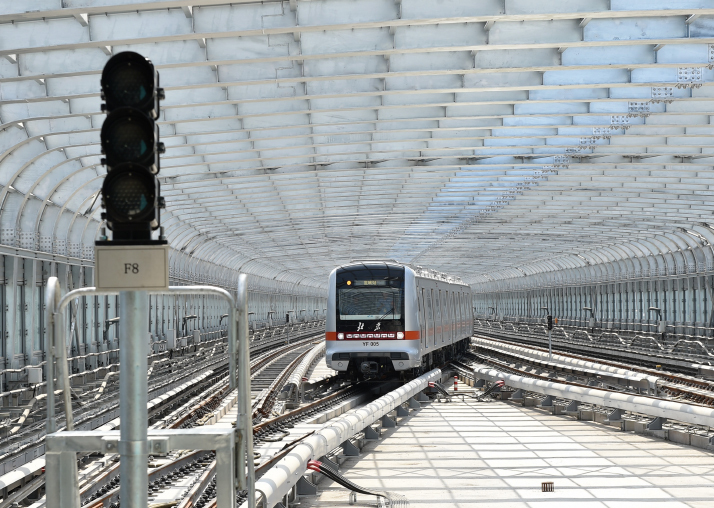 The Yanfang Line, being constructed in Beijing's southwest suburbs, will be China's first fully domestically-developed automated subway with nine stations on its 14.4-km main line. The decision to build the wholly automated line was made in 2013 while China was busy expanding its metro system. "It is an exciting decision," said Xu Ding, an official from Beijing MTR Construction Administration Cooperation. "Before, we would spend a lot of money purchasing facilities abroad, since our technology was quite limited. "In addition, when these facilities had problems, we could only make simple adjustments or else we had to wait a long time for the foreign providers to analyze the issues," he explained. In 2010, China launched railway research and development on the auto-operation system. Now the system has been totally developed domestically. Technological advances gave metro expansion in many Chinese cities a strong boost. Since May 2013, cities only need approval from provincial authorities rather than national ministries to build a metro line. 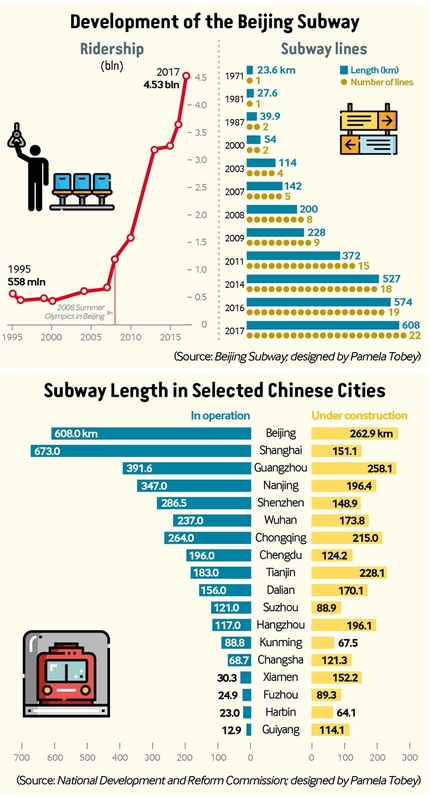 From 2010 to 2015, China built roughly 370 km of subway lines each year, investing 1.2 trillion yuan ($189 billion) in these projects. By April this year, there had been 31 cities in China's mainland that have a metro in operation and another 15 had been approved with projects under construction, making China the country with the world's longest subway lines in operation. Shanghai's railway system, which opened in 1993, currently holds the title of being the world's longest, spanning 673 km in total. "Urban rail transit not only helps with urban space expansion, but also boosts economic development," said Li Guoyong, an inspector of the National Development and Reform Commission's basic industries department. At the end of 2017, the National Development Reform Commission announced plans to relax the requirements needed for local governments to pursue subway projects. It included lowering the minimum population from 3 million to 1.5 million, which means more third- and fourth-tier cities can submit proposals. "China's third-tier cities are actively building metros. This enthusiasm will be a key driver of infrastructure building," said Jiang Shenggang, a metro expert in Fujian Province on China's southeast coast.